Whether they are hard or soft cover, thick or thin, large or small, heavy or light, old or new, owned or borrowed – the traditional book exists in all shapes, forms and genres. The e-book lacks this spectrum of physical appearances. While the rise of the e-book as the book’s successor is often debated from an economic point of view, I intend to focus on the physical and spacial aspects. How would a world without books look? Would we loose a bit of our past- a piece of our heritage? More importantly, will this fiction ever become our reality? 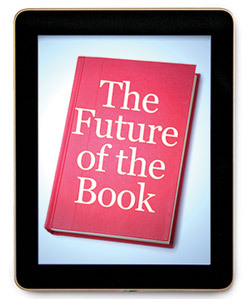 Will new reading devices substitute paper books? And besides the possible cultural losses, how would the new media alter our perception of the world, our interaction with the environment and our notion of the self? Let’s take a peek into the Futureader. Books as we know them transcend, define and create spaces. Reading material exists practically everywhere. Whether we take it on the train, the plane, to school, or for some (male) individuals even to the toilette; the book is a medium that has an existence independent from locality, traveling between public and private spheres. Books are contained in libraries all over the world, creating conglomerates of knowledge and places of inspiration, exchange and socialization. Book sales and distribution happens in distinct physical and virtual places, in the real world as well as the realm of the Internet. Hence, space and books are, whether bound to a location or independent from such, closely related, interacting and shaping each other’s existence mutually. What happens therefore, if such places disappear? Where would we go to find the quiet, calming atmosphere of a library? What will (online) book stores sell? What happens to the bookshelf as a furniture item, or even as a piece of art? Will library walls become empty, or will shelves be substituted by a multitude of flat, interactive screens? Or, in a larger sense: What does the lack of books mean for the concept of spaces, places and locality? As McColough says in his article On the Urbanism of Locative Media about the changing dynamic between space and humans through new technologies; perhaps also through the lack of books we will encounter “places with sense, instead of sense with places.” Perhaps readership and book cultures will “take shape” around individuals and technologies, as opposed to institutions and buildings. Will this create new public spheres or advocate a individualized reading experience? What makes reading an escape from reality, a venture into the realms of knowledge or a soothing activity after a long day of work? Feeling the book, smelling the paper, having dedications from friends and family adds to the act of reading as a personal, melancholic and even emotional practice. For some it serves as an escape from the hectic world and for others as a means to educate and learn. Smell, haptic, sound and other sense-inspiring components are significant parts of this adventure. How would that sensation change when the book is substituted by a lit screen that does not feel, look and smell the way we have become adapted to over decades? Will we get the same meaning and interpretation from the same book, when perceived through a different channel? Or does content and the coherence change together with the medium? The book creates and shapes an intimate and private space. In a book individuals find creativity, knowledge, information, thoughts and world views, the past and the future, as well as whatever they have been seeking. The book is not part of the web, it does neither run out of battery nor does it crash. And except for in a very abstract sense, the traditional book has limited potential to monitor its reader. How will that transform when people start using electronic devices instead of actual paper? Will our personal e-books leave an electronic trail of information that will be picked up by marketers to customize advertising and sales? Can an unknown number of people look into our personal habits, everyday lives and likes as well as dislikes? And how much does what we read say about who we are? In a sense we already leave that kind of trail by paying with a chip card at the corner bookstore. So perhaps this kind of monitoring could become an advantage to create personalized customer servicer. Or will it increase people’s control upon each other, fragmenting public spheres and increasing the gaps between readerships? And most importantly, will we internalize a notion of being watched when all the above takes place? Reading could potentially become a two-sided form of monitoring and learning, with the reader on one side and the Internet on the opposite. Thus, will Foucault’s concept of the panopticon appear in a transformed way, where, as Manovich posts in The Poetics of Augmented Space, instead of one big brother, many little brothers are watching? And above all, am I even asking the right questions?